I had the Mix Grill this time. Fantastic!! Fresh meat off the grill. The plastic knife cut through most of it like butter. Not the lamb though but still really good. It was more than enough food. I will always go here if the truck is open when I go for lunch. Customer service was great, very friendly and talkative group. Tacos how ever were not good at all. very bland flavors that mushed together. the slaw and "special sauce" are what made it even worse i think. overall wish i got something else the meat platters smelled and looked good but if your craving tacos and you actually know what good tacos taste like, steer clear. The meats are so good!! Flavor and tender!! Happy when I see it at the Reston Location. First time at Rio in Reston today and tried the 3 fish tacos. The flavor was not overwhelming and a hint of heat in the secret sauce. However, I felt the taco slaw made each one get very soggy fast and difficult and runny to eat. The fish had a nice grilled flavor and the secret sauce a good compliment. Maybe the slaw is too saucy and would be better plain? I would still come back to try another entree. Convenient to Reston businesses. Food was good, but for $12 did not think it was worth it. Need to double the meat or add dessert. Would not pay $12 again. Que rico!!!! OMG…sirloin was amazing…i asked to buy a chorizo and they gave me TWO GRATIS — on the house!!! Great truck, food and customer service!!!! You will see me again! Chicken empanada was awesome, great flavors! Chicken n cheese was good, chicken was a little dry. I wish I would have ordered 3 empanadas! Delicious! Chicken had great flavor. Fresh bun and tomatos, very good! I just had the steak salad. Delicious, fresh-cooked, sliced steak on a bed of greens and tomatoes with blue cheese crumbles and a packet of salad dressing. Not amazing but not terrible, either. Pretty good steak, done medium. Wish the slicing was a bit more thorough since now I'm tearing at the meat at my desk with my teeth and a plastic fork. 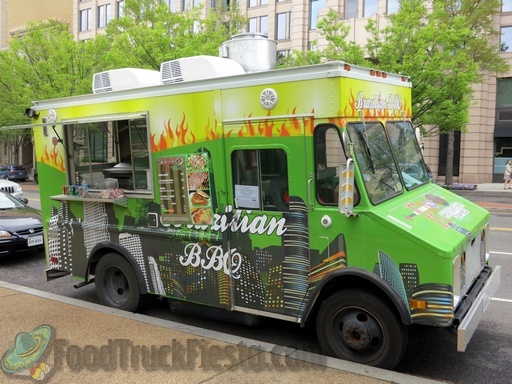 Rio Churrasco food truck serves Brazilian cuisine. The operate in the District, with plans to serve in Virginia!